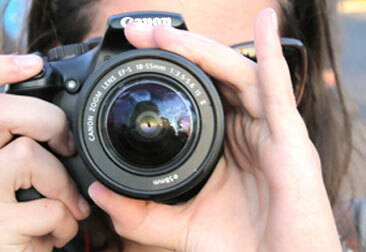 The 2-Week Photography Summer Camp for kids is an exciting, intensive exploration of digital photography. Students will be provided with a digital camera (for use during camp) with manual functions and will edit on Adobe editing software. During the 2-week program, students will learn the technical components of the camera and aesthetic components of photography utilizing both natural light and working in the studio learning to set up studio lighting. We encourage our students to be creative and to think of each project as a an opportunity to make a statement of artistic, documentary, journalistic, or commercial intent. Building on the foundation of our one-week camp, students in our 2-Week Photography Summer Camp for Kids will experience on-location photo shoots at even more interesting locations, and the two-week course also includes a social media/building your portfolio class. Subway transit may be included with certain on location photo shoots and fares will be covered by NYFA. Upon successful completion of the program, a graduation ceremony will be held, including a slideshow celebrating the students’ best 3-5 shots. All graduating campers will take home a NYFA flash drive with their portfolio.